This is an OPED piece I wrote for the Bay Journal News Service which was published on 8/19/2014. I have added photos and links. Here’s a link to the Downstream Project’s Amy Matthews Amos blog about it. Surviving a heart attack is a huge wake-up call that usually warrants a change of diet. Toledo, Ohio just survived a heart attack!! Their drinking water from Lake Erie became toxic because of a huge algae bloom. Algae blooms are caused by too much nitrogen and phosphorous in the water. It’s their wake up call and it’s time for a change of lifestyle. Lake Erie algae bloom. Photo by Peter Essick of National Geographic. The algae that caused Toledo’s heart attack is naturally present in most water bodies including all of the Great Lakes, the Chesapeake Bay, the Albemarle Sound and the Gulf of Mexico. Too much nitrogen and or phosphorus (nutrients) can cause these algae to grow to enormous sizes called “blooms” giving off toxic substances that harm humans, wildlife, and the aquatic ecosystem. Algae blooms are also responsible for “dead zones” which are areas in water bodies so depleted of oxygen nothing can live. Nitrogen and phosphorus are major components in fertilizer, manure, and sewage. Improper use of these nutrients contaminates our streams when rainwater washes off agricultural fields, feedlots, lawns and golf courses. Failing septic systems and outdated wastewater treatment plants also contribute to the excessive nutrient loading of our streams. Reducing nutrients in our streams and rivers is the cure; some call this a “pollution diet”. We have a “pollution diet” underway right now in the Chesapeake Bay watershed and it is working. Nitrogen and phosphorous levels in the Chesapeake Bay have been cut in half since the mid-1980’s despite the fact the population in the Bay watershed increased 30 percent from 13.5 million in 1985 to 17 million in 2012. This is an incredible achievement! The “diet” is working. Reducing nutrients in streams is not rocket science. We know how to do it. Each of the six states in the Bay watershed came up their own “pollution diet” to reduce nutrient loading into their streams and rivers. These six plans were approved by the Environmental Protection Agency several years ago and together form the Chesapeake Clean Water Blueprint. Lots of people are working together to implement the Blueprint. Farmers are fencing their cows out of the streams, planting riparian buffers, using fertilizers more responsibly and reducing soil erosion by using no-till methods and cover crops during the winter. nutrient management and have eliminated phosphorous in lawn fertilizers. Citizens are paying stormwater utility fees to help fund stormwater management projects. There are deep-pocketed lobbyists from outside the Bay watershed that don’t like the pollution diet for the Bay. The Fertilizer Institute, the American Farm Bureau Federation, the Corn Growers Association, the National Pork Producers Council, the National Chicken Council, the National Association of Home Builders and other lobbying groups associated with activities that contribute to nutrient loading are suing the Environmental Protection Agency over the plan to restore the Chesapeake Bay. Even more disturbing is the fact that the attorney generals in twenty-one states, most of them in the Mississippi watershed signed “friend of the court” briefs on behalf of these deep-pocketed lobbyists. Meanwhile, Toledo can’t use their water and the dead zone in the Gulf of Mexico remains the second largest in the world. Clean water is a choice. The people of the Chesapeake Bay watershed have agreed on a plan to get there. Successful implementation will result in safer and more abundant seafood, jobs and tourism. We will have a healthier world; something we can be proud of. Want to help? Sign the petition here. The red states are the ones supporting the lawsuit against the Chesapeake Clean Water Blueprint. Click on this image to help us defend clean water. I lament that we have to waste time and money on a lawsuit because we want/need cleaner water. What happened in Toledo is unfortunate and tragic. For a remedy, they need to look no further than the Chesapeake Clean Water Blueprint. It’s a “pollution diet” that is working. Yes, yes–Bobby. Telling the recovery story straight, using good analogies and repeating often the main lessons/ideas. Are you also a “Toastmasters” guru? Sail Forth…; & be strong, John Reeves Rockingham Co.
Big Corp Greed (BCG), a pox on our land. Very interesting article, Professor. I like how you laid out both sides of the same coin. Meaning you talked about not only what we could do to improve the situation here, but also what we are currently doing right. I don’t see that too often; it really lays out everything one needs to know. Along the same lines of what Charlie said, I can’t wait for big business to see that cleaning up our water bodies is actually in the best interest of everyone. Then we’ll really see change. Maybe BCG, Charlie mentions, is the bump in the road to recovery. I agree with Josh and this article. The issue and the solution is clearly laid out. If people do not engage in best management practices for farming, fertilization, and waste water management, then what happened in Toledo could happen again. Clean water is a necessity for everyone. If we don’t work to fix these issues now, we will have to pay for it in the future. I second what Caitlin said about the plan already being laid out. I wanted to learn more about the process and how it could be applied in Toledo, so after reading this article, I followed the link to the Chesapeake Blueprint page. I read through that to see how the plan that helped the bay get clean could be applied to the issue in Toledo. One feature of the Chesapeake Bay Blueprint was the development of two year milestones for pollution reduction. I think this was essential to the plan’s success because it broke the problem down into time periods that were easier to conceptualize and deal with. Perhaps if these types of smaller milestone goals were put in place in Toledo, then people would be more willing to work on the health of the watershed. Very good Ashleigh! Thanks for digging deeper and I agree with you, the two year milestones are essential. The fact that we have to harm the earth so much and in result put ourselves in harms way before coming together to work on fixing the problem is sickening. What’s even worse is that when we do come together the rich and greedy attempt to stop any progress for their agendas. I also agree with Josh K. when he said ” I can’t wait for big business to see that cleaning…is in the best interest of everyone. If everyone were in the same boat on issues like these we could all do some amazing things to save people and the planet we call home, hopefully we wont be too late. Let’s hope not Codey, earth is a beautiful place! I completely agree with you though and very well said. It is sad that so many individuals are working tirelessly on implementing better management practices throughout many watersheds but big businesses hold them back simply because of greed. It makes zero sense to me as to why everyone cannot agree on solving these issues. As soon as these corporations realize that they are doing nothing but harming themselves and their surroundings change will occur but until then we just have to continue the “pollution diets” where allowed. I agree Codey, it is difficult to understand the greed of the lobbyist party when there is evidence that the efforts to clean up the Chesapeake Bay have already been successful. It’s frustrating to see how much the Chesapeake Bay has already improved even though there are clearly lobbyists and other parties opposing the cleanup project. What could be possible if lobbyists and other parties opposing the cleanup project didn’t exist? I wonder if a cost analysis including human, wildlife, and ecosystem costs and benefits was designed and published would change some of the lobbyists opinions? This event in Lake Erie truly should be more of a wake up call than it is. The fact that it is not gaining even more notice than it has is, I believe, partly due to the “deep pocketed lobbyists” and everyone who has an economic interest in continuing cheaper farming practices. More responsible farming practices will have to be deemed economically valuable in order for these disasters to become less common. I know in Virginia Beach this summer the Ocean Front was “closed” due to high levels of harmful bacteria several times, and this has become relatively common place over the past summers. It’s bad for tourism if the beaches close and tourism money is what keeps the city afloat, and even thriving. I think if the water quality continues to deteriorate in Virginia Beach due to practices upstream something more will be done about the unsafe practices. In the end it will be the loss of money that will drive change. I agree with Susan. If polluted water can negativley impact a city, that that should be the first warning sign that things need to change. Unfortunatley this isn’t always the case because things take time…especially to become an issue in the eyes of the people who are able to remedy these problems in a more efficient way than the common person. The word needs to get to these people in a more effective and efficient way and I think that that is where the common person can make the most difference. I agree with Susan that it will be money that will drive change. I think this would be different if more people were educated on the matters at hand. I think a lot of times we spend our money with out thinking about where that money is going or who it is going to support. Its hard to understand how there are any companies that are lobbying against clean water. Its comforting to know that the people of the Cheasapeake Bay though have already implanted a plan though and are trying to do something about it. I agree with Susan on the issue of money and its a sad realization that in order to try and save our environment and get things to change that it must first hurt someone’s wallet. As residents of this planet one would think that we could pay our rent by tidying up our mess and being able to keep the “yard” in good condition, but we should already be doing that as a courtesy and out of respect for the Earth. I also believe that there needs to be more emphasis placed on what people are doing upstream and the education of these people in order to show them that what they are doing upstream could severely harm the people and environment downstream. The response to these currents events, both Lake Erie and the suing of the EPA legislation towards the Chesapeake Bay clean up, is beyond shocking to me. I love the statement from your post, “Clean water is a choice” because it is a choice that is getting constantly looked over until things hit rock bottom. The sad part is that those who are suing the Chesapeake Bays efforts towards their good decision, are those who are not making the choice to improve the environment around them. Even though it may be more economically feasible to sue the EPA vs. clean up their watershed, the effort is worth it in many ways. I would also assume that cleaning up the “dead zone” would gain more public support from those in the watershed than continuing to overlook this ongoing issue. By not making a decision to clean up these waters, we are only hurting ourselves more. Well said! After reading this post I, too, was struck by the seemingly simple idea that “Clean water is a choice.” And yet large organizations are doing everything in their power to prevent any progress in this area, just to save their own money. Their selfishness and lack of regard for the impacts of polluted waterways on their fellow citizens shocks me. I also would like to acknowledge Allyson’s point that concern lies in the immediate costs of cleaning the watershed. I would also urge an emphasis on the potential for increase in the future. While it may seem to these businesses like investing in the future of our water is fiscally irresponsible, it is important to consider the immensely higher costs of being without this resource. People, especially those in positions to implement change, must face the harsh reality of a world without clean water. Because this is the path we are on if these companies continue to refuse to cooperate with the good intentions of the EPA. I would to add to Allyson’s great point that cleaning up the dead zone would be favorable to the public, by highlighting the post’s mention of increased job availability, more favorable tourism incentives, and improvements to the fishing industry that result from cleaning up the Bay. Emphasis on these areas may help appeal to the business senses of resisting companies, and help find common ground on which we can all work towards restoring the health of our waterways. Happy to see that VA and the rest of the inhabitants of the Chesapeake Bay Watershed are taking responsibility and initiative to make sure that we don’t mimmic the circumstances of that in the Gulf Coast and now Lake Erie! I am, however, appalled that there are some individuals like these deep pocketed lobbyists that can blatantly see the positives from projects like the Chesapeake Clean Water Blueprint and still try to contest them for economic benefit. Until America moves from an economic standpoint to an ecological standpoint, there will only be short term solutions to long term issues. It is very surprising to me that this is the first many of our classmates, as well as myself have heard about the issue at stake. The lobbyists are putting themselves above the common welfare of world. This doesn’t come as a surprise, since they have been doing this for decades, but to stop a progressive movement that is currently making great strides is asinine. These people need to look pass their egos and apply common sense to the common problems for the common good. Based on the blueprint Ashley read, I agree the best method is a long term plan with milestone checkpoints along the way that document the positive progress being made. Cleaning our waterways will not happen overnight and we need to bite the bullet in order to preserve them for many, rather than have a few people profit. It really was shocking to find out how many people are fighting against a healthier environment for us to live in. I live at the mouth of the Chesapeake Bay in Hampton and have for the largest part of my life. The Chesapeake Bay is clearly a vital resource to those that live around it. A large part of Hampton was founded on its seafood industry but it is sad to see some stores starting to close up as they cannot produce yields like they used to. These algal blooms are obvious signs of an unhealthy ecosystem and those responsible with putting nutrients into Lake Erie need to be a lot more careful. Since the “pollution diet” is working for the Chesapeake Bay, a similar plan should be implemented with Lake Erie. Algal blooms, if left unchecked, will continue to cause economic and environmental damage until something is done about it. It is sad to see people fighting against these benefits for their own personal gain. I think that is great that there have been serious, successful changes made in order to clean up the Chesapeake Bay watershed. These could definitely be applied to Lake Erie in order to control the nutrient outbreak that has done so much damage to the ecosystem. The one thing that bothers me the most are the states that are against the clean up project. After looking at the various states that are fighting the blueprint, I realized that majority of them are in the Midwest where majority of the crop and livestock production for the country happens. Naturally it would make sense why these states would fight against limited use of fertilizers because it is vital for crop production and is where the big corporations operate. What bothers me the most are the states that are surrounded by the contaminated bodies of water that are against the blueprint. You would think that the areas that have major water systems that contribute to the Gulf of Mexico or Lake Erie would be willing to help restore the natural ecosystem. Specifically states that are along the southern coast that could benefit from restoring the Gulf of Mexico for fishery purposes. Another state that caught my eye was Michigan. They are surround by the Great Lakes, and have done their fair share of damage to the ecosystem. Of all states, they should be one of the leading supporters of the blueprint and implement actions that could restore natural conditions in the area. As mentioned in the article, as well as other posts, clean water is a choice. Everyone could benefit from restoring damaged watersheds directly or indirectly. First off, yes this is a terrible situation, but I am not surprised by what is happening with big business. This is the frame of mind that big business has had and will always continue to have unless they see adverse effects in their daily lives. People naturally want more, but they fail to look from all perspectives and do not realize that when they gain, they sometimes take away from others. I do not mean to get all philosophical, but I felt like the science and statistical information had been explored already. Bobby: In the late 1960s problems in Lake Erie, i.e., a 40 square mile mass of algae in the middle of the lake, the Cuyahoga River catching fire from the dumping of waste oils at Cleveland, a huge area at the south end of Lake Michigan contaminated with steel mill wastes from the Gary area, Lake Tahoe threatened with human waste, Puget Sound fisheries destroyed, the Hudson River in serious trouble – and many more widespread problems resulted, finally, in Congress enacting the bi-partison Federal Water Pollution Control Act Amendments of 1972, incidentally, over the veto of President Nixon. The goal of the Amendments was the elimination of the discharge of pollutants to the Nation’s waters by 1985. Great progress has been made. But obviously much more needs to be done. The Chesapeake Bay TMDL evolved only because of legal action forcing EPA and the Bay states to develop clean-up plans. It is unfortunate that short-sighted economic and political interests are willing to undermine efforts to protect our water resources on which future generations will be dependent. Wow this is an interesting post about what’s going with the watershed. I was shocked to find out that Toledo doesn’t have clean water because of an excess of nitrogen and phosphorus in their water. I like how this pollution diet is working and that this post shows 2 sides about pollution diet to the bay. I don’t like how all these lobbyist groups are against the pollution diet and suing the EPA on the restoration of the bay. I was also surprised to find out that 21 attorney generals are supporting these lobbyist groups. I don’t understand why all these lobbyists and attorney generals are so against the diet pollution and preventing it from continuing, when the diet is working. I believe anyone who can, should help with the cleanup of the pollution in the bay. Thanks Alex, Why do you think they are suing the EPA? Its a shame that such a drastic wake up call such as the situation in Toledo has occurred but hopefully it can spur on some progress in responsible management of excess nutrients.With effective clean water reforms having been as successful as they have been in such a large watershed as the Chesapeake, there must be hope that progress can be made in Lake Erie and it’s watersheds. Hey Michael, what a nice surprise! Thanks for your comment. That hope is called the Chesapeake Clean Water Blueprint and it’s working. See you Tuesday. After reading this, I was intrigued by the lobbyist groups that were suing the EPA over the Chesapeake Clean Water Blueprint so I started reading up on the court case. I learned that a few weeks ago, a federal judge ruled in favor of the EPA by upholding the Total Maximum Daily Allowance requirement and the EPA’s authority to issue such regulations. The ruling was based off of the power vested in them through the Clean Water Act, which grants the EPA the authority to set pollution limits on impaired waters. I know things like this take time and it’s a gradual process, but since the EPA won this case on a federal level and have a broad authority, how long do you think it will take before the the EPA is able to collaborate with the regions surrounding other severely toxic bodies of water such as Lake Erie, to create and implement their own specialized “pollution diets”? This article really surprised me. I think that the “pollution diet” is a great way to monitor the nutrients that are entering the streams. It is clear that we know where the extra nutrients are coming from, i.e fertilizers, manure, sewage, and runoff from agricultural fields. I really can’t wrap my head around why there would be groups lobbying against this so called “pollution diet”. This makes me think that they are either stubborn, or that they are just not well informed as to what added amounts of nutrients can do to they watershed. If the water is being so over-polluted in areas that you can’t use it, shouldn’t it be obvious that something should be done? Fresh water is not an abundant resource, and something needs to be done to help! I agree with you, Katelyn. I think it is absolutely absurd that the Chesapeake Bay was not “drastic enough” of a wake up call to implement measures to avoid future messes such as this. Especially since we are aware of the causation, this unfortunate event for Toledo, Ohio could have been avoided. The health of humanity is reflected in the health of the planet. Its time to put people before profit. I’m very shocked by the number of states that are not supporting the Chesapeake Clean Water Blueprint because how important our waterways are to our society. I liked how you did address how in recent years there has been drastic improvements in reducing nutrient runoff into our waterways by fencing in cattle, planting riparian buffers, etc. This is a big push forward to put pressure on industries that are too stubborn to change their habits. It is clear when reading this article that the industries against the pollution diet are those who are doing the most damage currently. They are using these cheaper farming techniques to make a higher profit. By exposing their selfish actions the public can hopefully force them to make the drastic changes needed. Water quality is an issue that has disproportional affects making it somewhat of a human rights issue. Companies supported by deep pocketed lobbyists are able to contaminate the water sources that communities rely on. It’s about time that these companies are held to a set of standards that would keep the Chesapeake healthy. Algal blooms are a major issue because they stop the ecosystem services that both people and the ecosystem in general relies on. The fines for exceeding the pollution limits set by the EPA must be pretty costly, as they should be, if there is this much opposition against the plan to restore the Chesapeake. The statistic of cutting the pollution in half in the Chesapeake Bay since the 1980s is astounding. With the bay being one of the most populated watersheds in the world, it shows nearly anything can be improved with the right practices. There’s not a doubt in my mind that the Mid-West can get this fixed, but it seems as though money is the driving factor out there. The large industries (farming and agriculture) probably don’t want to implement these better practices for cost issues or don’t want them to possibly hinder their production. Eventually common sense will have to prevail right? If they keep ignoring the signs now, they will soon be forced to have to recognize the issue. And by that point, the situation could be much worse and become even more costly. I am curious however, how the people in the Mississippi watershed feel about this issue and if they’re in favor like the people in the bay watershed or if they’re on the side of the lobbyists since farming production is such an economic industry in that part of the country. It is amazing to me that the leaders in Ohio would let the state of their drinking water deteriorate to such a level. With the algae growing thick on the surface of the water it is a very visible problem, which you would think would warrant immediate action. Sometimes people just need that fire lit under their butts to wake up and do something, and I think this poisonous algae is that fire. The people of toledo are lucky that they already have the Chesapeake Bay to model their “diet” after. Like you said professor, there are so many benefits to cleaning up their water both for health purposes and for economic purposes. It just makes sense as the next course of action. Water is an extremely precious resource and although many people consider it to be a reusable resource, it wont be in the future if we keep polluting it to the extent we have in the past. I hope the Lake Erie crisis opens peoples eyes to the impact we can have on our environment and I hope that the people of Ohio step up (like the people of the Chesapeake Bay area) and show us that our impact can be good as well. For one, I am completely appalled that almost half of the states in this country are supporting a lawsuit that is against the prevention and clean-up of pollution in one of the largest natural bays in the world. The lawsuit itself seems quite ridiculous to me, especially coming from several organizations that should be concerned with the well being of this countries freshwater supplies and ecosystems. The level of greed and desire for personal gain in this situation is quite sad. In the case of Toledo, I only hope that the success in the Chesapeake Bay can be a driving force for those involved with the reformation of Lake Erie. The fact that the local governments and citizens that this problem directly effects have already taken action is good news, and with the support of the EPA and others in favor of keeping our waters clean I believe that success can be found. Wow! I never thought algae would have such a huge impact on drinking water resources. The title you gave the article represents this issue nicely. What a scary wake up call! I am glad to see that the States impacting the Chesapeake Bay have stuck to the goals of reducing contaminants in the watershed. There is hope. I like thinking of the plan as a diet. I think it helps make it more relateable to the average person. I am curious how so many states who take no benefits from the Chesapeake Bay and that the diet won’t effect still find it important to show their support for the lawsuit. Especially considering most of them are part of the Mississippi River watershed or on the Gulf Coast. I would expect those states to better understand the impacts of water resource health. I certainly hope they aren’t doing it out of self interest figuring that if polluters stay in the bay’s watershed they won’t move into other states. I am glad to see the situation in the Bay has increased over recent years though. Its nice to see good news about a water resource every now and then. The Chesapeake Bay’s watershed is extremely large (60,000 sq miles), even furthering the importance of reducing pollution. Having such a large watershed increases the opportunity for pollutants to runoff into the bay. While fencing off cows, planting buffers, and reducing fertilizers is a good start it seems like there is much more that can be done about preserving and helping the bay. While I was rafting on the Shenandoah River this weekend, I couldn’t help but notice the cows in the river with us and their friends at such a close proximity. After reading this post, I can’t believe how the contributors to this issue are so commonly found in plain sight. Yet, I have a feeling the septic system failure may play a larger role than we typically discuses. The obstacles this issue faces against deep-pocketed lobbyists is a scary though, and I would hate to see this same tragedy occur in the Chesapeake Bay. Great article. I was driving from MN to CT and stopped in Toledo for the night to discover there was no water to be had in Toledo. All restaurants were closed and the grocery store had all produce removed and the deli counter was locked shut. I couldn’t help think that the cost of riparian planting and other nutrient mitigating measures pales in comparison to the amount of business lost in the region. I’d really like to see Ohio become a leader in water quality. Lake Erie and the Gulf of Mexico really need help. David, thank you so much for posting this. What a story! Thanks for sharing this. I agree that something needs to be done about areas that have been polluted by people. We have only one planet, so we need to make sure we take good care of it. However, it is good to know that there are solutions out there working. We just need to make sure those solutions are implemented in more parts of the world. After reading this, I was compelled to look further into the lawsuit that the Farm Bureau and other big agricultural industries filed against the EPA in regards to the Chesapeake Bay Blueprint. The arguments presented in the lawsuit were that the pollution limits exceeded the EPA’s authority, that the limits were based on faulty science, and that the public did not have adequate time to participate in the comment process. I was pleasantly surprised to find that the court ruled against every argument that the lobbyists had presented. The judge affirmed that the EPA did indeed have authority under the Clean Water Act, the scientific modeling used by the EPA was fully sufficient, and the 45-day comment period was generous given that only 30 days were required. It really is nice to read about wins like this for the environmental conservation community. Preston, nice reach! You will be pleased to know that the “polluters” lost their appeal to the Third Circuit Court in Philadelphia. They are now in their 90 day period to appeal to the Supreme Court. I found it interesting that an excess in nutrients was the biggest cause of trouble and is such a problem for the watershed. It just seemed odd to me that excess nutrients could have such a negative impact on the environment and the inhabits that live in it. I’m happy to see the states have come together to solve the issue though. The fact that the “Chesapeake Clean Water Blueprint” was established and put to use shows promise for the watershed becoming healthy again. That being said it bothers me to see powerful “deep-pocketed lobbyist” be so against a group of people trying to fix the problems we as humans have created. I see no reason to fight a group of people that just want to help make our earth a healthier place for all inhabitants. It also troubles me to see that these lobbyist rather put their businesses in front of the well being of an entire city. Not having drinking water is a big issue, and I would think everyone would agree that it needs to be fixed. The corporations against the “diet” plans are being selfish and greedy, of course, due to wanting to maintain their monetary gain. Although they want to sell as much fertilizer or other products as possible, I feel like more people would be inclined to buy from them if they were to become environmentally friendly. Altering their product or maintenance plans in a positive “green” way and would be a great new way to advertise. This would be a win for them and a win for the environment. Fighting the diets is only hurting them by showing that they are heartless and only care about their profits. I think that the diet is a great change for the environment. Since it is working so well for the Bay, I think that plans such as this should be implemented for all waterways with impending algae problems. Not only would it stop the algae excess, but it would preserve the rest of the ecosystem as well. Algae is important as a food source, but also has the power to suffocate biota in multiple ways such as depleting oxygen as it decays. The Chesapeake Bay Plan shows how policy should be implemented. Stakeholders at all levels should be involved and held responsible during policy planning, and that’s what we’re seeing in the Chesapeake Bay. It is concerning though that there is a disconnect between what citizens want and need and what is being advocated by industries and individuals within our government. Industry should necessarily look after the well-being of its constituents if it wants to continue producing, and the same goes with our government. Everyone in the U.S. wants and needs clean water and that’s what our industries should be spending their money on and what our government should be outlining policy around. 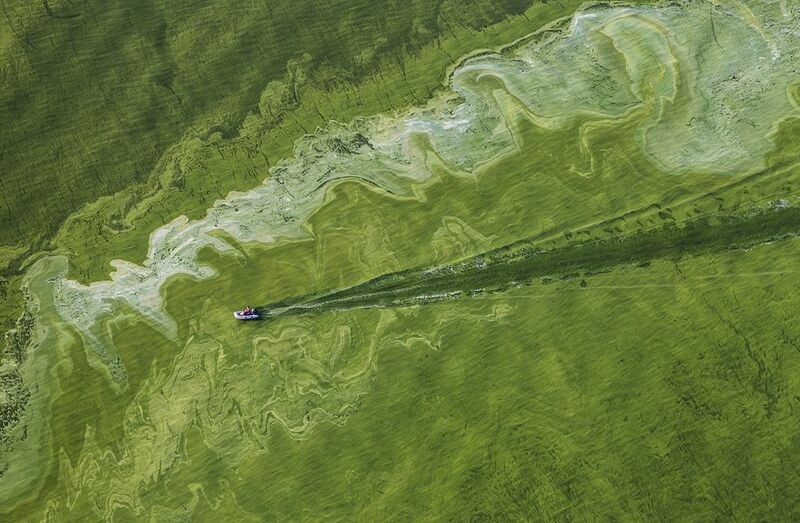 It is said that a picture is worth a thousand words, and the image of the algae bloom in this article does just that. It is difficult to conceive just how out-of-control the conditions were at Lake Erie for such a phenomenon to take place. This kind of occurrence, on such a massive scale, is not natural. I agree that the Lake Erie, and likely other watersheds, would realty benefit from a “pollution diet,” such as the one the Chesapeake Bay has. I love that so many people in the Chesapeake Bay watershed have come together in such a large group effort to clean up the Bay. I believe the Chesapeake Bay diet is only the beginning of a movement to restore and maintain clean waters across America. It’s incredible to see the interactions between groups for differing ends. The fact that so many states along the Mississippi have a stake in the game (even Alaska) shows that people are concerned that techniques to improve the cleanliness of the water might be used in their area. They don’t want that because it costs extra money and cuts into the bottom line of industry and government. Industries want to cut costs, and if industry makes more the government gets more of it in the form of taxes. The real problem comes from a lack of conscious and thoughtful conservation of resources. With little concern for what they do to affect the livelihoods or living standards of others (such as Gulf fisherman) farmers take actions which cause headaches for others. People who have their lives affected by poor management also have little recourse relative to large lobby groups who buy politicians and officials to side with them. This leaves them hung out to dry by the government that is supposed to protect them and their fellow man, who did not take the time to research and learn about the real costs of their actions. With the current development of the Farm Bureau now moving up to ask the Supreme Court to throw out the Chesapeake Bay Clean Water Blueprint, this article holds great importance and value. The escalation of this battle between deep-pocketed polluters who are resistant to change and those trying to help the situation is disappointing, but also not surprising given the history of this relationship. This Toledo event should have served as a learning experience nationwide while the success of the Chesapeake Bay Blueprint should also become the model nation wide, or even worldwide. It will be truly interesting to follow this case with the AFBF. I hope that it doesn’t take another disaster or large scale issue to see the widespread change that our watersheds need. I think that we should make sure that best management practices are being used globally. When the water gets so toxic that someone has a heart attack from the water then I think it is really time to do something. We need to make sure their is clean water for everyone now and for future generations. Problems like these need to be fixed and establish plans in which these things do not occur again. I think that the word “diet” is a perfect example to sum up what needs to be done to help water pollution. It is term that everyone is familiar with, even if you know nothing about water pollution you already have a general idea of what needs to be done because everyone knows the term diet. I remember reading about Lake Erie a few years ago, but I did not know all of the details that followed it. This blog does a great job of taking a catastrophe like the Lake and brining the attention to the whole Chesapeake Bay. I loved reading about both sides of the debates going on and looked more into the Save the Bay Foundation. I find it admirable that you use your blog posts to educate people that may or may not be familiar with current environmental events. Clean water is in the top most important necessities that all living life needs. I’m amazed that organizations and states would really try to stand up against the Chesapeake Bay Blueprint. There shouldn’t be lobbyists going against something that they NEED. That blows my mind. Great way of grabbing the readers attention right off the bat with comparing the excess nitrogen, phosphorus, and algae to a heart attack. This shows the severity of the issue immediately after you start reading this post. This is a great illustration of how these different factors can negatively effect our water sources. It is great to know that initiatives have been taken in order to try to take care of the Chesapeake Bay. In order for things to take affect everyone need to work together in becoming environmental friendly. The lobbyist group that is suing the EPA over the Chesapeake Clean Water Blueprint is very concerning to me. It is clear that they hold their position on this issue due to monetary assets and benefits. These lobbyist groups need to do more research in order to understand that they are doing more harm than good. It is incredible to think that such an enormous indicator of poor water health can happen, like the algae bloom in Lake Erie, and people are still lobbying against tactics that will prevent it in the future. This is a perfect example of the disconnect between legislators and their level of interest about the environment. It also shows the power that the large, money-making companies have over politicians. I am glad that the Chesapeake Bay is being used as a template for the “pollution diet” and that its progress is being recorded for others to see. The spread of initiatives such as this will only grow stronger with exposure to people who are not aware of these problems and can do their part to remediate the waterways near them. Hopefully the companies who make a profit off of the pollution of water through fertilizers and poor farming techniques will recognize the importance of healthy water and change their initiatives to help instead of harm. I really like how you’ve compared an algae bloom to a heart attack. Last semester i took and marine biology class and learned extensively about algae blooms / dead zones and this is the best metaphor Ive heard. Its very interesting to me that despite the fact that the diet is helping in the Chesapeake bay, the federal government has not enacted policies similar for the entire country. Algae blooms can happen anywhere where there is too much nutrient in the water so its very surprising we don’t do more to stop them. Its also always interesting to me how the farmers along the Mississippi river are on the deep pockets side even though eventually it will cause harm to them as well. Hopefully more states will look to the Chesapeake Bay’s ‘diet’ and follow in the footsteps. The first algae bloom I was ever informed about is located in the Gulf of Mexico. This bloom is massive in size and generates huge die offs thanks to poor practices in farming and agriculture up stream, on the Mississippi River. Just like you mentioned, there is an easy and simple solution to stopping these blooms and that is cutting off their food supply. However, when people are making a profit and happen to be destroying the environment simultaneously, they tend to put higher priority in the money rather than the environment. My ISAT Capstone project happens to be researching algae as a bio-fuel and have wondered if we put the algae blooms to good use. Our thought process was to introduce an oil producing algae at the site of previous algae blooms and use it to produce oil and feed stock. If this is possible, farmers would not need to change their current methods and harvesting of the algae would reduce nitrogen and phosphorus run-off before an algae bloom could occur. It’s awesome to see the states impacting the Bay the greatest, stepping up to the plate and working hard to achieve lower pollutant levels. Current pollutant level numbers in the Chesapeake Bay demonstrate the ability to rally a large population of people to tackle an environmental issue and succeed. I think often times people think they are too small to impact the greater good, but as in the Chesapeake Bay it took individuals to come together and tackle this issue. I experienced a little bit of this issue this summer when I was an intern stormwater engineer in Waynesboro. The stormwater department has gotten the OK from the city to start charging citizens for their discharged stormwater. The people of Waynesboro are not to excited about this new ordinance and charge but eventually through education and pollutant reduction, they will see how important regulating stormwater is for the health of their natural water sources. Where do these farmers, home builders, etc. think they are getting /their/ water? You would think such a necessary commodity like water would be respected by all. Instead, some of these associations and manufacturers, many of whom I presume do not even base a lot, or any, of their operations within the mentioned damaged watershed, are trying to fight against laws that could and would affect them down the road, in favor of the environment. This is a classic case of “Not in my backyard” mentality. Until these attorney generals and associations become negatively affected by the operations “outside of their backyard”, they will realize that money doesn’t make the world go ’round. What is even more absurd is that these farmers can actually /make/ money implementing BMPs that would also reduce pollution runoff. Perhaps it isn’t as black and white as I perceive it, but it seems pretty clear cut that stubbornness is holding us back. This was a great summary of this current issue. It is astounding that these companies are suing the EPA for attempting to clean up a watershed when there is obvious environmental degradation occurring. This is an issue that will eventually have to be addressed whether or not they agree with it and this lawsuit is only pushing back the changes that need to happen; eventually, the dead zone in the Gulf of Mexico will grow enough to demand a change or we will have to tragically write off the Gulf as a productive ecosystem and a part of our economy. Comparing the algae blooms in Lake Erie to a heart attack is a great parallel to convey how changes in “lifestyle” could prevent this entirely. This blog post really conveys the power of money and how it disconnects people from local communities; it blows my mind that they are demanding it is unfair they change their business methods when they are directly negatively impacting multiple communities and ecosystems. i can’t help but wonder why as a society we don’t leverage more negative social implications on bad-industry practices such as what the farm bureau and construction/development industry are doing with the bay. I am optimistic for the future, however, especially with social media and its widespread access. In current news, volkswagens’ emissions ruse and the recent price gouging of pharmaceuticals and their respective social media backlashes give me hope that future offenders shall be held accountable. When the public is educated on what we stand to lose and social media can do its job of disseminating information then anti-environmental policies shall risk social ostracization. “pollution diet” that has been started by the cleaning up of the Chesapeake bay. Policy makers have already made moves towards clean water and reducing pollution, and that trend will only continue to grow until we have healthy and clean bodies of water. The picture of the Lake Erie algae bloom truly captured my eyes the second I opened up the article. Its discouraging to observe images such as this one, and it feels even worse to realize that this problem could have easily been prevented. However, its nice to know that we are part of the Chesapeake Bay watershed and its ‘pollution diet’, but we need to continue this healthy trend and teach others both nationally and globally the importance of controlling/reducing nutrients. Down with the deep pocketed lobbyists! I remember seeing Lake Erie on the news and seeing images of the green water washing up on the shore. I believe the “pollution diet” should be implemented there so that they can see the same results we’re getting in the Chesapeake Bay. After seeing what happened in Lake Erie I can not understand why people could possibly think action doesn’t need to be taken to limit nutrient loading into our waterways. The fact that Toledo had to shut off their water should have been the kicker for those lobbyists. I understand those lobbyists and the parties involved in opposing the “pollution diet” are doing their jobs and fighting for their own interests, but at a certain point they must realize that action must be taken for right this problem.